Born on August 12, 1843 near Labiau in East Prussia, Leopold Colmar von der Goltz joined the German army in 1861. In a widely varied career Goltz served as soldier, military lecturer (in Berlin from 1878-83) and writer (publishing The Nation in Arms in 1883) before becoming, in June 1883, military advisor to the Turkish army while still a major. Tasked with the modernisation of the Turkish army, Goltz was so successful that it required the intervention of the major European powers to call a halt to the Greco-Turkish War of 1897 which Turkish forces appeared to be on the verge of winning. 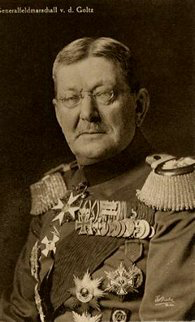 Having returned to Germany in 1897 as a Lieutenant General Goltz next saw significant service with the outbreak of war in August 1914 - having been made Field Marshal in 1911 following further service in Turkey - when he was appointed military governor of Belgium following its seizure by the German army. Deeply dissatisfied with this role - he had no appetite for oppressing the civilian populace - Goltz was consequently relieved to be despatched back to Turkey in November 1914, becoming aide-de-camp to Sultan Mehmet Reşad. 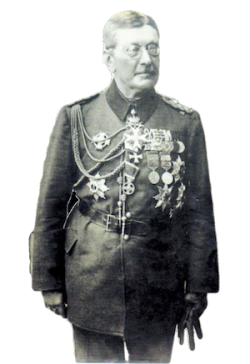 Handed command of the Turkish army in Mesopotamia following a power struggle with Liman von Sanders, Goltz proved unpopular with Enver Pasha. Goltz's plans for a large-scale attack upon the British in Egypt or India therefore found little favour. He was subsequently appointed to command of Sixth Army in October 1915, heralding a much-desired return to regular soldiering. Goltz successfully halted the Anglo-Indian army among the ancient ruins of Ctesiphon on November 22, 1915. The following month, on December 8, Goltz followed up this success by penning Townshend's force at Kut. Having then repulsed the large British force despatched to relieve Townshend Goltz conducted the 143-day siege of Kut which finally ended with Townshend's surrender on April 29, 1916. However Goltz never lived to savour his victory: he had died ten days before of typhus, although rumours persisted (unproven) that he was actually poisoned by a group of Young Turk officers.